"Karen Halbert, a former computer scientist and college professor of mathematics, transforms the beauty and patterns she sees in the numerical universe into the natural world of her paintings. Dynamic symmetry contributes to the underlying harmony of her pictures. Halbert spent her childhood in the American west and, following in the footsteps of many artists, returned to her roots to capture on canvas the particular quality of the Southwest. Though it is in Santa Fe that Karen has found her true home, she can be seen painting en plein-air in the fields throughout New Mexico as well as in locations such as the Grand Canyon, the Pacific coast of California and on the beaches of Hawaii. In her studio Halbert uses sketches and photographs from her plein-air work to create images full of the emotions she feels while working out-of-doors. "Karen Halbert is active in Plein Air Painters of New Mexico, serving as volunteer website administrator (www.papnm.org) and, as a way of giving back to the artist community, she volunteers painting classes and tutorials, combining her background in teaching with her extensive knowledge of the tools of Classical and Impressionist art. Halbert is indebted to mentors Albert Handell, Doug Higgins, Roger Williams and others in Santa Fe." Author: Janice Jada Griffin, Art Director of the Marigold Arts Gallery. The river has always intrigued Karen Halbert. In her youth she spent much leisure time camping out by the river. She feels most comfortable within sight of waters: the Columbia and Hudson Rivers, as well as the Pacific and the Atlantic oceans. 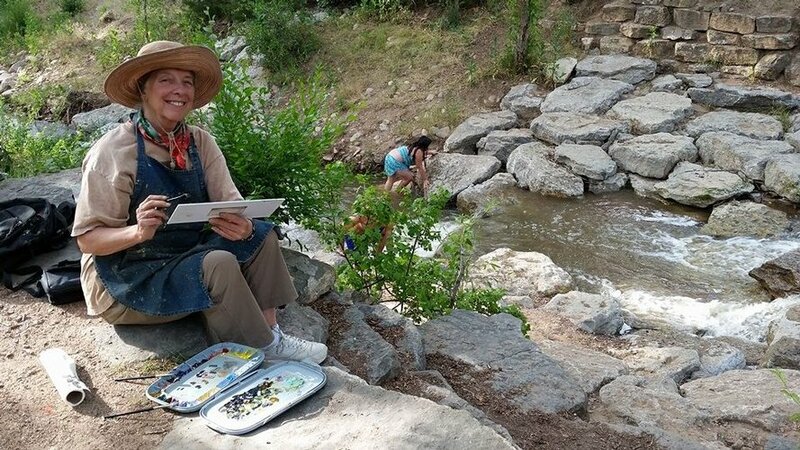 Now in New Mexico, Karen can be found painting “en plein-air” at the Chama, Rio Grande, Santa Fe and other rivers and waterways, hoping to recreate the magical moments of youth that they inspire. Also, Karen enjoys painting the canyons, gorges and cliffs of New Mexico. 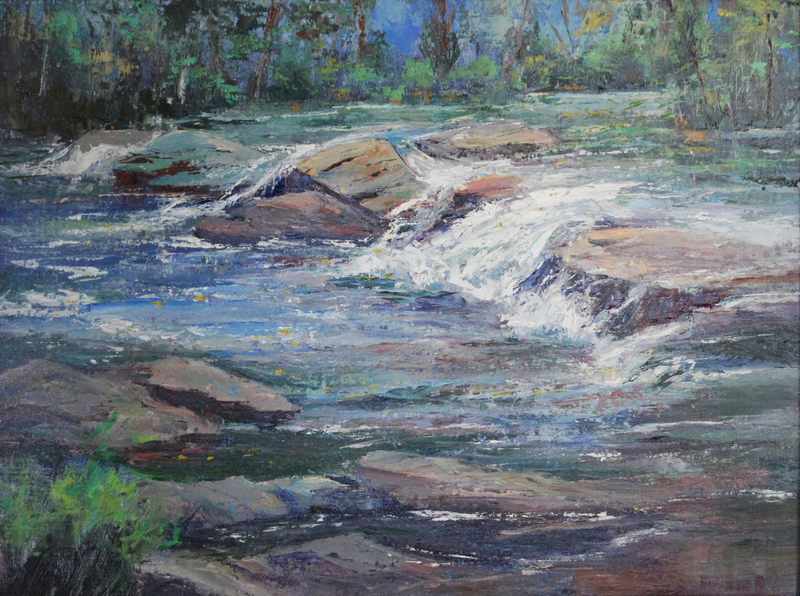 Karen recently won an award of merit from the Plein Air Artists of Colorado at its 2016 annual members' show in Boulder, Colorado for the plein air smaller version of the "Rushing Santa Fe River" at the top of this page: "Rushing Santa Fe River", 18x24, oil, was sold recently..
Karen is represented by the Marigold Arts Gallery on Canyon Road in Santa Fe and the Purple Sage Gallery in Albuquerque.